Remember when everyone started hearing Clint Eastwood, the catchy little number from a bunch of animated characters who took the world by storm? Nobody had a clue they were the brainchild of Blur frontman, Damon Albarn. It was an unusual success story and the quirky, virtual band even went on tour in holographic form. Well, finally the black metal world have their answer to the 2D pop group in the shape of Belzebubs and, although we weren't aware we wanted it, we're thanking Lord Lucifer they exist. Last year we reported they'd signed for a three-album deal with Century Records and that their identity is shrouded in mystery. Black metal lends itself to certain amount of veiled allure (what with the heavy mask of black and white makeup), yet these guys have taken it a step further: The band are only known by their pseudonyms Obesyx, Hubbath, Sløth and Samaël, their own UK PR doesn't even know who they are. Plus, there is of course the fact that they aren't even flesh and blood. 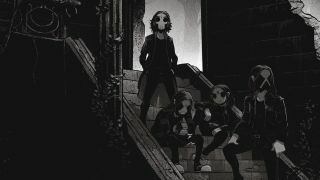 According to the bands official website, Belzebubs were "originally summoned together in 2002" and hail "from the abysmal forests of the mystic North". If this novel gimmick is lost on you and you are seeking something trve kvlt, then ignore the fact they are animated and let the music speak for itself. We're pretty impressed by these comic-strip kvltists, and it's got us wondering: Who is behind this? Is it someone we know? A black metal legend? Or perhaps a project from well-known in another subgenre? With their forthcoming debut album featuring an impressive roster of guest talent – including the likes of Desibelius, ICS Vortex, Skvllcraft and more, and mixed by Edge of Sanity's Dan Swanö – we think the cat will be out of the bag in no time, and Belzebubs will reveal themselves to be a lot more than four novelty animations playing some indisputably brutal metal. Hell, who's to say Swanö isn't the mastermind behind the quartet? Our Spanish cousins appear to share our adoration of the equally cute and kvlt (how is that even a possible?!) comic-strip metallers, and have even featured them on a recent cover of their own version of Hammer. Despite Belzebubs having released only two singles in the past year – Blackened Call and Cathedrals of Mourning (featured above) – the band have managed to rack up quite an impressive number of Instagram followers. Presumably this is thanks to their illustrated image lending itself to the picture sharing platform (they are rather photogenic), as well as their crushingly good blackened metal. However, the corpse-painted cartoons have just unleashed their third track, Nam Gloria Lucifer, ahead of the release of their debut album later this month. So, essentially, they need some cash. Perhaps they should get out on the road then, eh? Speaking about the track, Hubbath says: “I love it. Nam Gloria Lucifer is an unholy alliance of crushing riffs and mesmerising melodies with a trve tear-jerker ending. It’s beautiful." The band's debut, Pantheon of the Nightside Gods, will be released via Century Media on April 26 and is available to preorder now.